The goal of Peachtree NORML is to provide information and education to Georgia citizens about the failure of an 80 year-old war on the cannabis plant. We do this by providing our opinion and links to information that encourage you to research the facts on your own. We do not provide legal advice and encourage anyone facing criminal charges to retain competent legal representation. 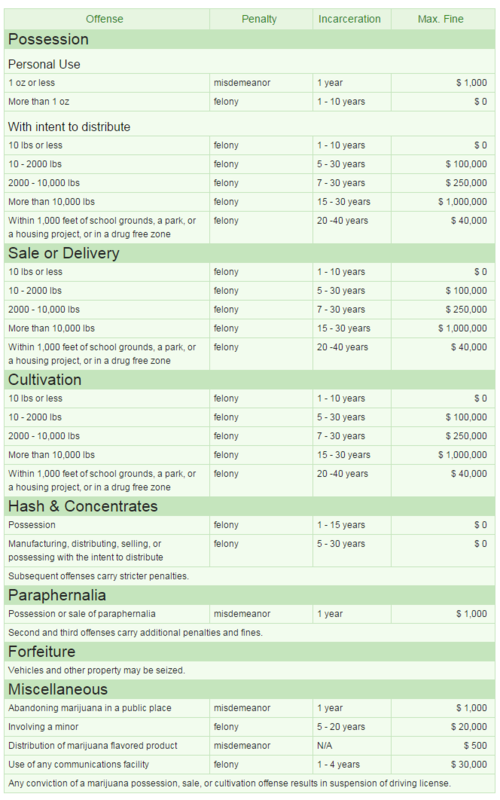 The below table, borrowed from NORML’s Georgia page, lists the penalties for various marijuana-related charges in Georgia. In 1990 there were 8,314 arrests for marijuana possession or sales by all of the local, county and state law enforcement agencies in the state of Georgia combined. By 2013 that number ballooned to over 35,000, with nearly 85% of those arrests being for possession only. Georgia ranks sixth in the nation in the number of people arrested for marijuana. No group understands the war on the cannabis plant better than Georgia’s African American community. In 2010 Georgia law enforcement officers arrested 389 out of every 100,000 citizens for marijuana, and African Americans accounted for 64% of those arrests In fact and a 2013 ACLU study entitled “The War on Marijuana in Black and White concluded that African Americans in Georgia were 3.7 times as likely to be arrested for marijuana than whites. so what do you do with the SESSIONS monster? Dont you wonder if it is truly unethical for a person who is sick to be denied a plant that can treat their illness, especially one that has never been known to cause death by over dose. Yet Opiods which cause thousands of deaths each year are the only option provided. Somehow as a prior R.N. this seems to impose a cruel interpretation of ethics based on a lack of understanding. We need to educate others and hope wisdom starts to correct this problem. Why cant we as Georgian’s get this put on the ballot. I am reading where 6 other states have enough signatures to push it through. Are we or can we not get enough signatures to change the law. Perhaps I just don’t know or understand why this is not being done in Ga. Even with out the Governor approval. Help me understand. All the data I am reading says their is somewhere around 70 % approval rate for medical cannabis. Help me understand or tell me what to do. I have a large network of supporters. What about the CBD-rich “hemp” sold in smoke shops? It’s cannabis flowers but it’s not marijuana. Would police even understand the difference? Would that get us a year in prison even though it’s legally sold over the counter with taxes paid on it? I was born in GA and have lived most of my life here. I’ve come to the conclusion that if I want freedom and relief in my lifetime the only answer is to move away from Georgia. This makes me sad but this state is so backwards on marijuana.. it’s the only solution I see. Otherwise I’ll just wait and feel bad for the rest of my life. People who are disabled or retired should have access to marijuana, not this silly low THC oil. There is NO good argument anyone can give as to why someone should be denied access to something that makes them feel better if the person is not in the workforce and not driving impaired. I guess some people think that it is evil to use a substance in order to feel better. It’s an easy thing for a healthy younger person to say but totally lacks empathy. Once my wife retires too, I think we will say goodbye to Georgia. That really makes me sad. I love Georgia but the politicians are really bad here. I am a retired Army combat veteran that suffers from PTSD. I live on the South side of Atlanta, GA. Effective July 1, 2018 those suffering from PTSD qualify to be on the Medical Marijuana registry. The problem I have if that I have under the care of VA doctors for 8 years. They will not sign any documents to support my efforts to get onto the registry. It has become unbelievably hard finding a Doctor that would help me get on the registry. If anyone has gone through this process of finding a Doctor that would help put you on the register, please respond. I take 16 pills a day and I can’t do it anymore. You can take your VA records to most of these folks and they will use them in considering a recommendation for you. Best wishes, and let us know if this works for you.